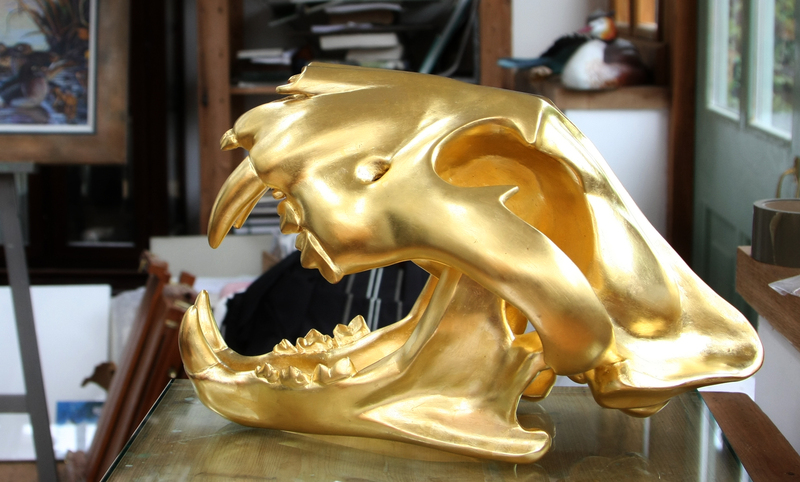 I wanted to make a sculpture that would provoke thought and debate around the threat of extinction and that unless we act (and act now) the tiger will be no more. 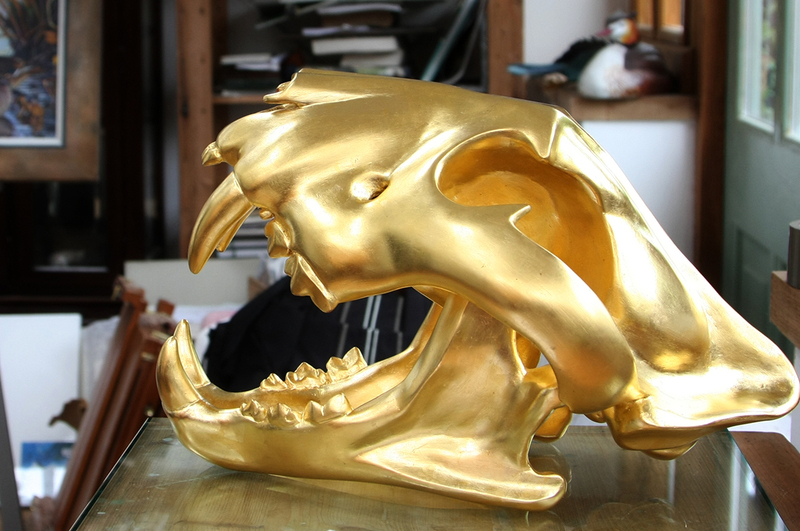 A spectacular sculpture of a gilded tiger skull inspired by the desperate plight of the tiger in the wild will form a stunning centre piece at this year’s Wildlife Artist of the Year exhibition at the Mall Galleries, London June 3-8. Created by Oxford-based artist, Martin Hayward-Harris, ‘2063’ is one of 140 artworks short-listed for the coveted annual art prize run by the David Shepherd Wildlife Foundation. “I am perplexed by man’s need to assume the qualities of big cats by consuming or destroying them, driven by a sense of both fear and awe,” explains Martin who was inspired by the passion of TV presenter Gordon Buchanan* in the BBC documentary Lost Land of the Tiger which showed tigers moving across borders and through mountain ranges, and revealed that wild tigers are becoming increasingly trapped amongst pockets of civilisation. The sculpture took three months to make. It references a real tiger skull, but is not cast from one and the open jaw was designed in from the beginning. The cranium was made from small wooden panels which were then plated in sections of flexible sheet. An internal casting was then made which was coated in eight layers of Gesso (a mixture of calcium carbonate and glue). The separate lower jaw was made from plate steel and incorporates stainless steel rod and carbon fibre. The whole sculpture was then hand polished and coated with clay bole. The final process was gilding by hand with 23.5 carat gold using the water gilding method. 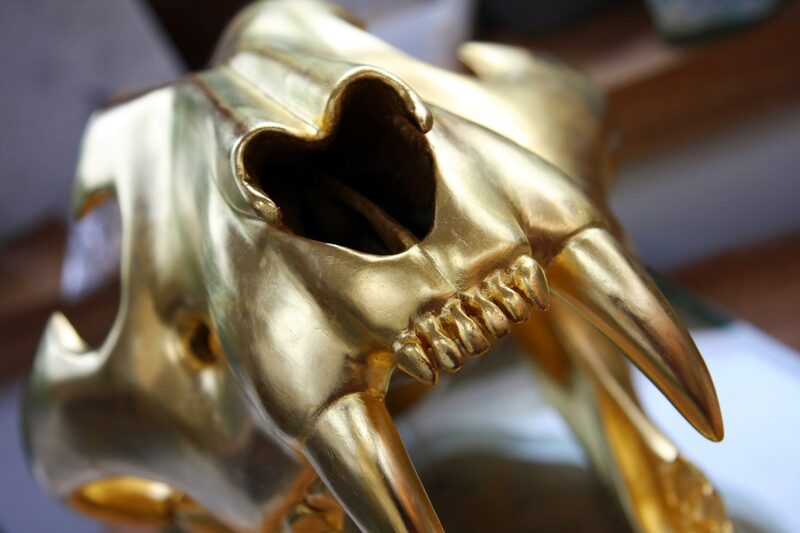 This was carried out by a professional gilder and took more than two months to complete. There are now only an estimated 3,200 tigers left in the wild. At present rates of attrition, and without serious efforts to raise awareness, stop the illegal trade in tiger parts and to conserve their wild habitat, some experts predict that the tiger will become extinct in the wild in 50 years’ time – in 2063 – the date chosen as the title of Martin’s work. 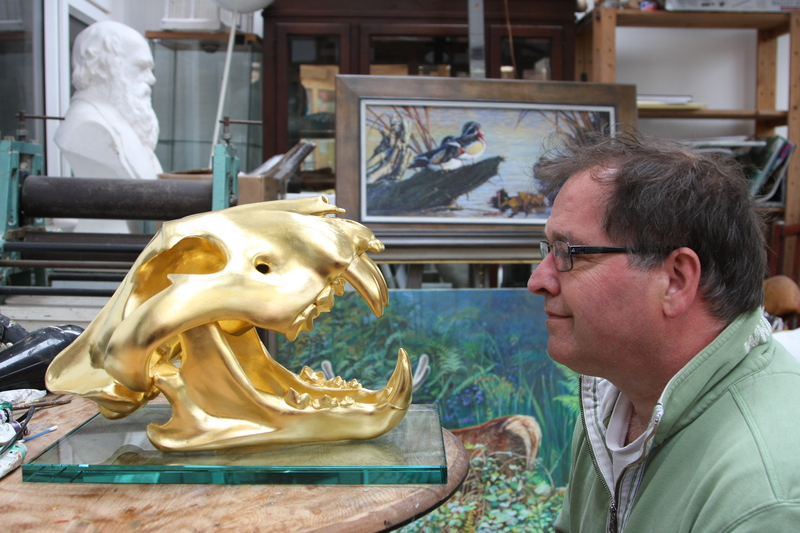 “I wanted to make a sculpture that would provoke thought and debate around the threat of extinction and that – unless we act, and act now – the tiger will be no more,” he says. The David Shepherd Wildlife Foundation, founded by the wildlife artist and conservationist David Shepherd CBE, has been running the annual Wildlife Artist of the Year competition for the last six years; its purpose is to champion wildlife art and to raise awareness and funds to support its work to save endangered animals including the tiger, elephant, rhino, painted dog and snow leopard. All of the original art on view during the week at the Mall Galleries is for sale with proceeds split 50/50 between the artist and the Foundation’s conservation work. Since its inception the competition has generated over £250,000 for wildlife and with 50 per cent of 2063’s sale price tag of £20,000 going direct to tiger conservation Martin will be contributing to the long-term survival of the tiger in the wild.